Past fields and pastures, around a bend, and over a creek there is a secret place I like to go. 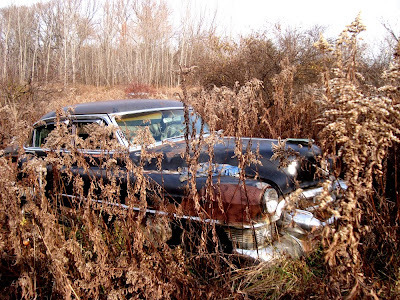 On a quiet back road, icons of another time stand proudly in their hidden home among the November weeds. Big rusty beasts grazing in the meadow. 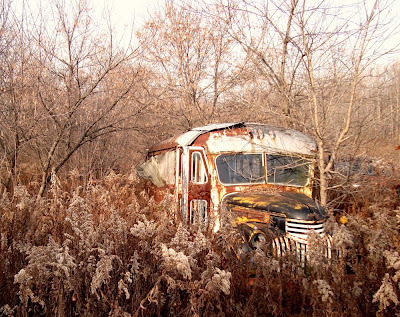 Steel bodies enveloped by fluffy goldenrod ghosts. Their stately grandeur is only enhanced by the natural backdrop I can't help but wonder about the people who drove them. Who sat behind this wheel? And what did they deliver in their world that is so vastly different from ours today? This sculptural art installation (or junk yard) never ceases to enthrall me. 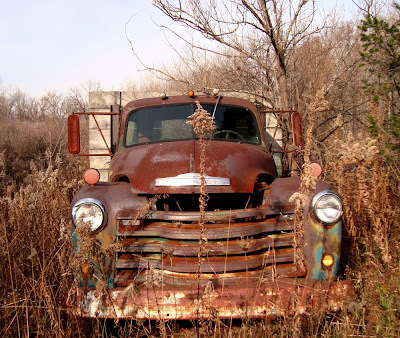 There are dozens and dozens of antique automobiles and trucks being reclaimed by this field. We had good friends visiting all weekend, and I'm so happy I got to share my tucked away treasure with them. Hope you had a little magic in your weekend as well! 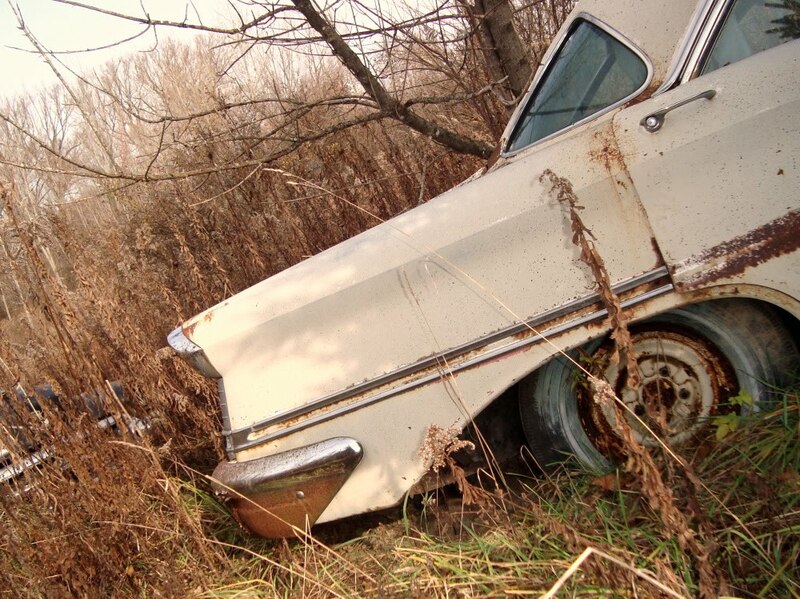 I love looking at old vehicles, it's fun to imagine what it would be like to live then. Nice photos, but bed place to put this old cars. what a unique post for you, i was surprised to see all of these pictures on flickr this morning. they make for interesting photos and thought. so glad you had such great friends over this weekend...i am sure it was filled with loads of fun and love! This is such a familiar scene for me. It was common to see old abandoned vehicles stashed behind crumbling barns and beside the railroad tracks when I grew up, but not like you have here with so many of them. It's kind of staggering to think that no one has hauled them off. Thanks for sharing them. 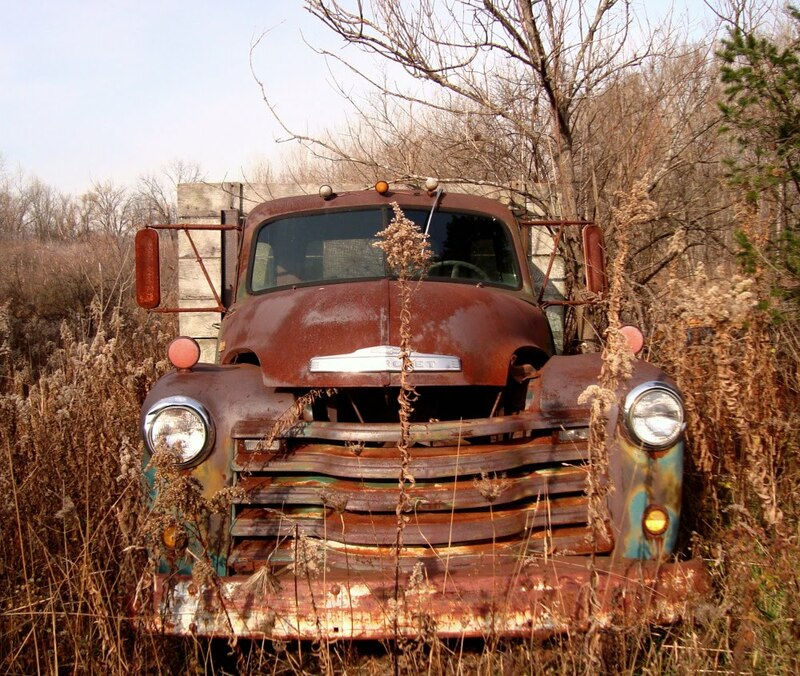 This reminds me of the David Wilcox song, "Rusty Old American Dream." There can be so much beauty in decay. Lisa, what I failed to mention is that this is one man's "collection"... and how I guess he has chosen to display it. great photos! it does make you wonder about the drivers of those trucks. i love thinking about the stories behind objects. 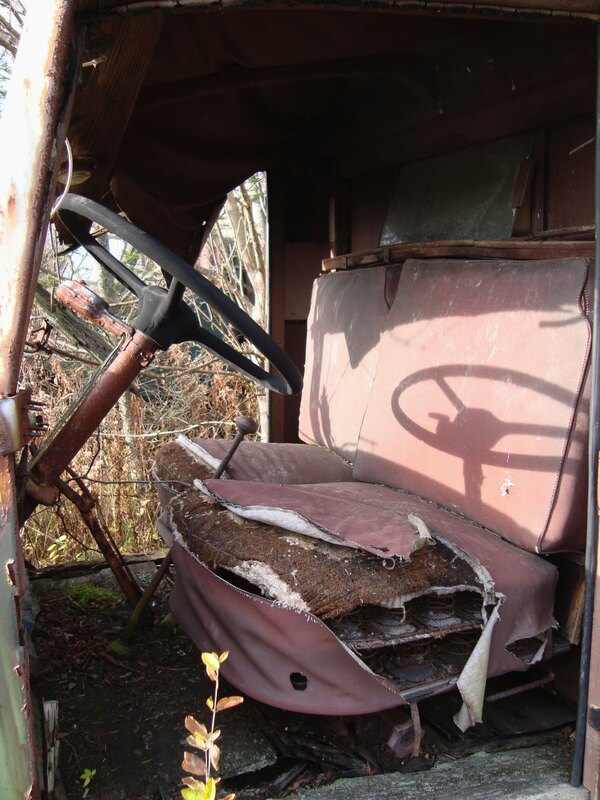 I really like this photos, the colors, the theme and decayed feel of them. Love "icons of a forgotten time" eloquently written and SO true! What a wonderful treasure! I often wonder about the people who owned my new found treasures too. Love the contrast between the rusty, rawness of the decaying cars and the softness and gentleness of the fields. Beautiful photos! really cool! places like this are a photographer's heaven. :) we have an old airplane boneyard here that I'd love to go visit. I LOVE finding spots like that! We have a couple around here that I never get to visit often enough. I think I will have to make time this week. I wanted to let you know I took dried corn husks to my grand kids aged five this weekend and they enjoyed husking, then they made collages with the corn and later we threaded some forjewelry for their mom. Great fun together. beautiful photos and words. Thank you. your photos paired with words are beautiful. these photos give an almost eerie feel, a graveyard of the past... certainly an incredible art installation, i would be there right alongside you with my camera! 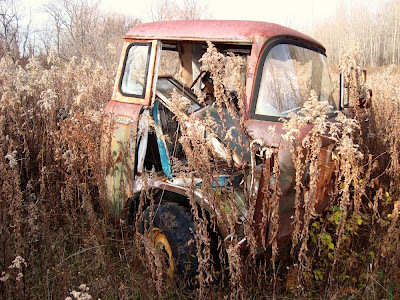 isn't there something so beautiful about the golden weeds of autumn, the rusted tones in these autos blend in seamlessly. What a fantastic place. I did a project while at art college on scrap jards, I think they are so inspiring and beautiful in an odd kind of way. This looks like my father-in-law's property! Only his field doesn't inspire such reverent sentiments in me. Maybe in 30 years or so ;). My grandfather had a similar collection in the "slough". I always wondered how the vehicles got to be there. Did they die slowly or quickly? Did they intend to be ababdoned or did they just sit there so long they became part of the scenery? Were they replaced by something shiney and new and simply forgotten about? And, now, I wonder what my grandfather thought when he looked at them - did he have fond memories of trips taken or did he think of them as an unsafe nuisance? 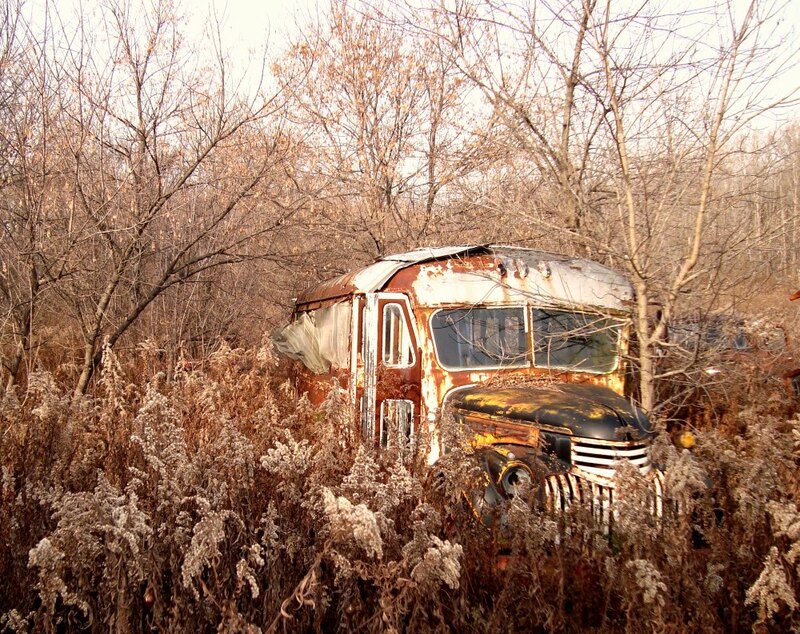 I absolutely love photos of nature reclaiming man made items. In college I did my final photography class project on a series of reclaimed barns and dilapidated houses. Shows the power of nature. Beautiful! I love these. 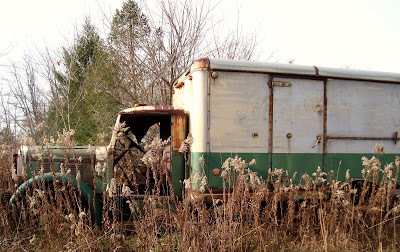 The old vehicles make amazing photographic subjects. I would have so much fun there.